The point of a field school is not to go to sites where the action has politely resolved itself and examine the leavings of more experienced excavators who have sorted out the story preserved underfoot. That’s what museums are for. Or maybe really well illustrated textbooks. 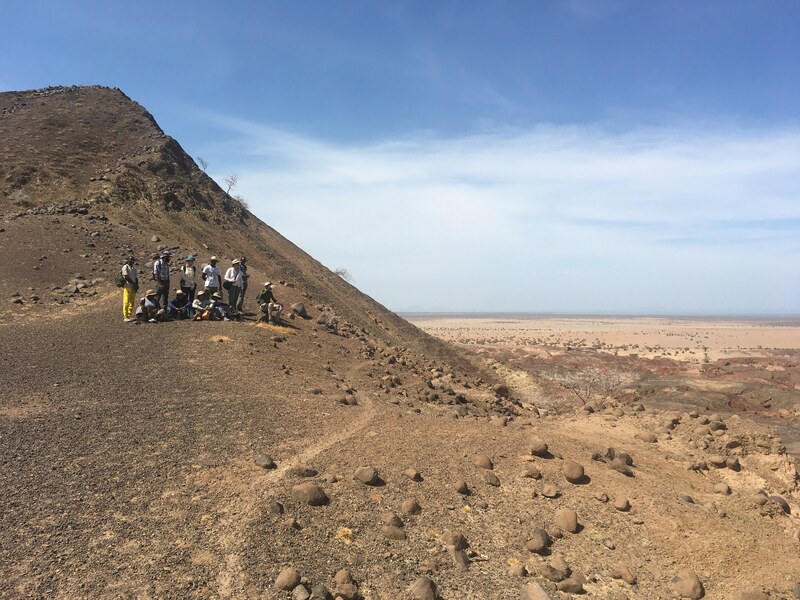 For the Archaeology module, Dr. Alison Brooks of George Washington University wanted to let the students experience every step of the archaeological fieldwork process, starting with figuring out the best place to dig. Of course, the whole process couldn’t be perfectly replicated, since we had a general area identified by Dr. Lisa Hildebrand of Stony Brook University. Dr. Hildebrand took the first step by sighting some hills on the other side of the river, thinking “those look promising” and deciding to investigate. 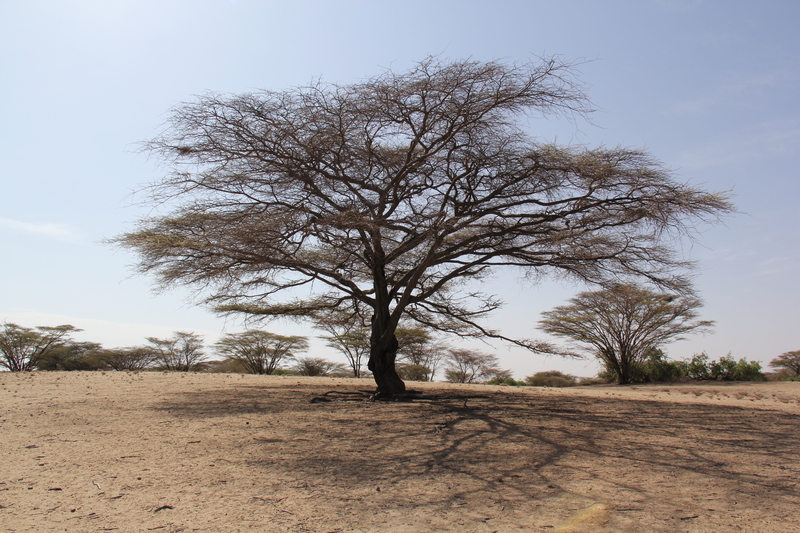 After getting a truck to the other side of the Turkwel, she discovered some material on the surface, took a GPS point, and resolved to investigate a little more someday. Dr. Brooks followed by making a preliminary sweep of the area the Sunday before our module began. While the rest of us were working on our sunburns at Eliye Springs, Dr. Brooks found a fragment of a human forehead at the site. This would be an interesting place to explore. An afternoon off spent at Eliye Springs. 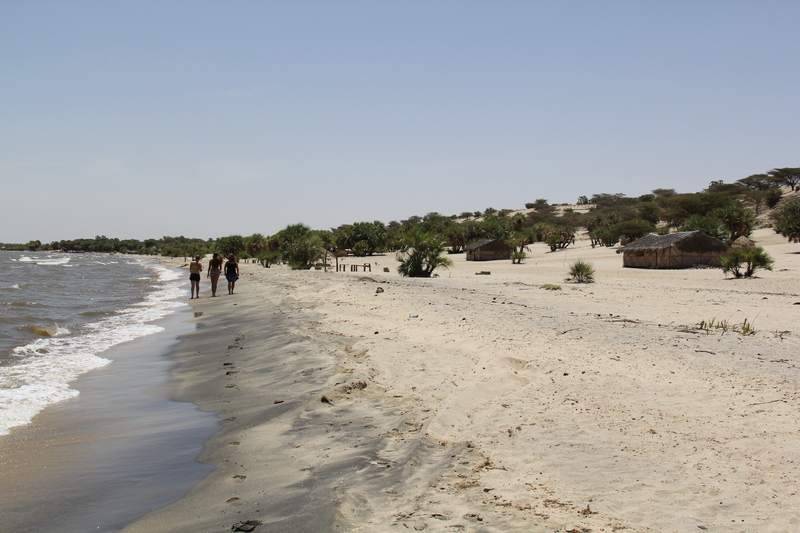 The beach along the western shores of Lake Turkana is actually the site of the discovery of an ancient human skull, so some of the students took a break from sipping cold fruit juice to do a little prospecting on an off day. 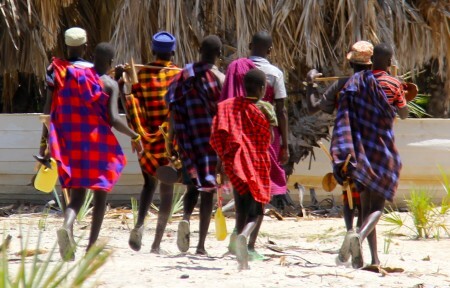 A crew of Turkana men take a walk along the shores of Lake Turkana near Eliye Springs. 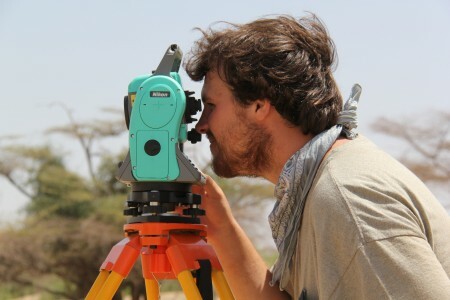 If the students couldn’t quite get in on the initial discovery part of designating a new site– we only have two weeks per module – the field school students were given the chance to do the first real survey of our site dubbed “Kangatotha.” To get there, we slogged through the Turkwel River each morning then piled onto the truck for a forty-minute drive downriver. 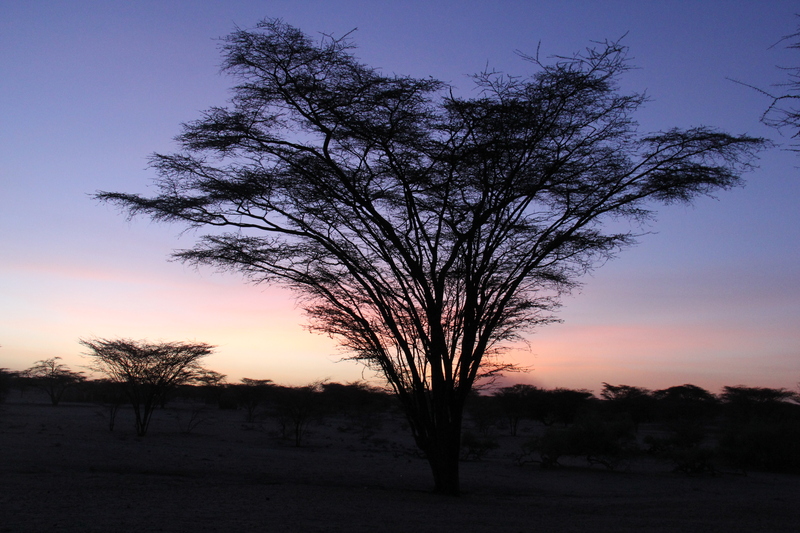 If the coffee didn’t do its job each morning, the chilly morning Turkwel did the trick. Our first day at the site involved first figuring out where exactly Dr. Hildebrand had identified material. Using her GPS coordinates and starting where she and her crew parked their truck, we followed her directions “south to platforms 100 feet from the cliff” as if we were searching for buried treasure. One of the largest acacias we’ve found near the Turkwel River and close to the field schools new excavation site. We found the scraps and flakes that had lead to the site’s initial designation. Now we were stepping into the unknown. Was there any more material? If so, how old is it? Who made the small chips of stone Dr. Hildebrand first pointed out? Would we find anything undisturbed underground? Gripping bouquets of survey flags, the students spread out over the landscape in teams tasked with surveying the North, East, and West. Each notable artifact or bone was flagged, recorded as a GPS coordinate and photographed. 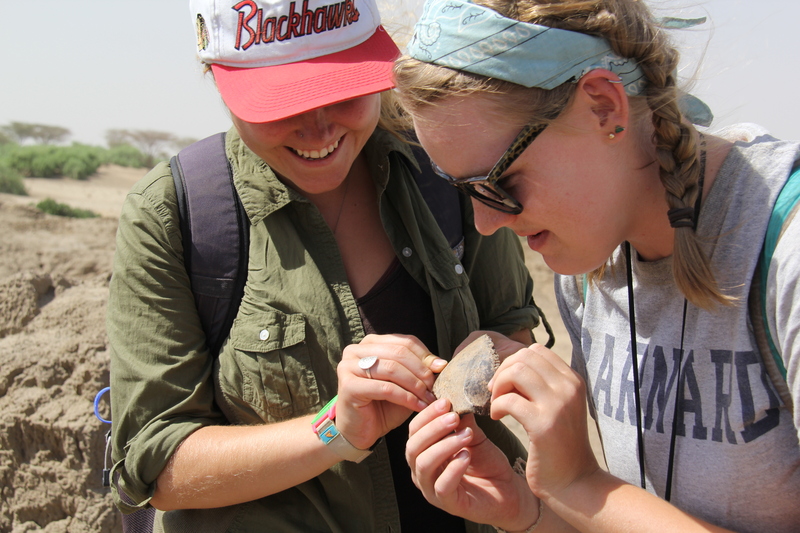 On the first survey Eve and Maegan identified a bone harpoon, a key technological innovation first invented in the Congo 80,000 to 60,000 years ago and a handy tool for the Holocene hunter-gatherers we thought we were dealing with. Rosie, Eve, Maegan, and Rachel explore the fine silt sediments near Kangatotha. Fish fossils and hippo fragments suggested we were walking out in the depths of paleo-Lake Turkana. Human artifacts were few and far between though. 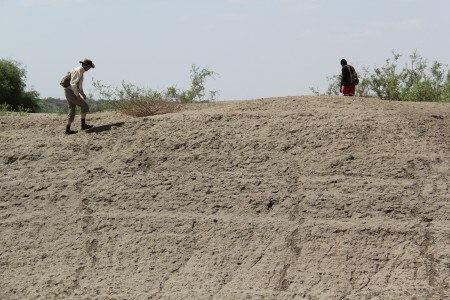 Marcel and Francis search for artifacts and human remains before moving out of the lake sediments into terrestrial sediments where they would find patches of red earth that they hypothesized were evidence of human-controlled fire. A bone harpoon found by Eve and Maegan on the surface of Kangatotha. This notched rib fragment is a beautiful example of the fishing tackle used by East Africans starting tens of thousands of years ago. Tim, Ana, and Ashley identified large fragments of pottery, a technological innovation that indicates people were starting to settle down (it’s kind of hard to stay on the move foraging when you need to haul around your crockery). 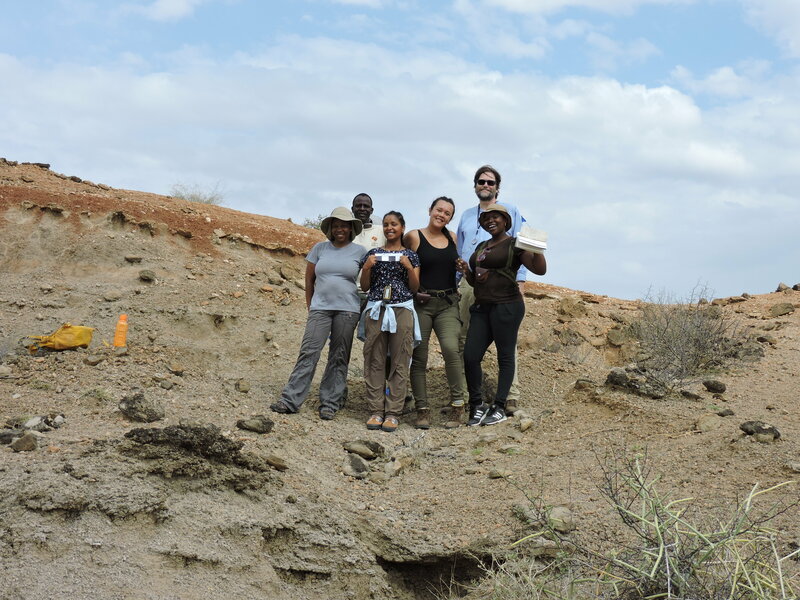 Natalie found several large bones and fragments of a hippo that must have roamed the ancient intrusion of Lake Turkana to the region. The next day we plugged in the GPS coordinates of the most promising discoveries and visited each point as a class, evaluating potential places to start digging. While doing a little extra exploring near a bone harpoon, Francis brought a large snake vertebra over to me for inspection. As I got excited about all the extra processes for articulation that indicated this was a constrictor vertebra, when Ingrid hollered my name. “In a sec!…We know this is a snake because…” Then Rosie said the magic words: “We think it might be human!” As much as I love snakes, it was time to take a closer look at the bone Ingrid and Natalie had found. They were right. We had another piece of forehead from a pretty big person. Two skull fragments, both of brow ridges. 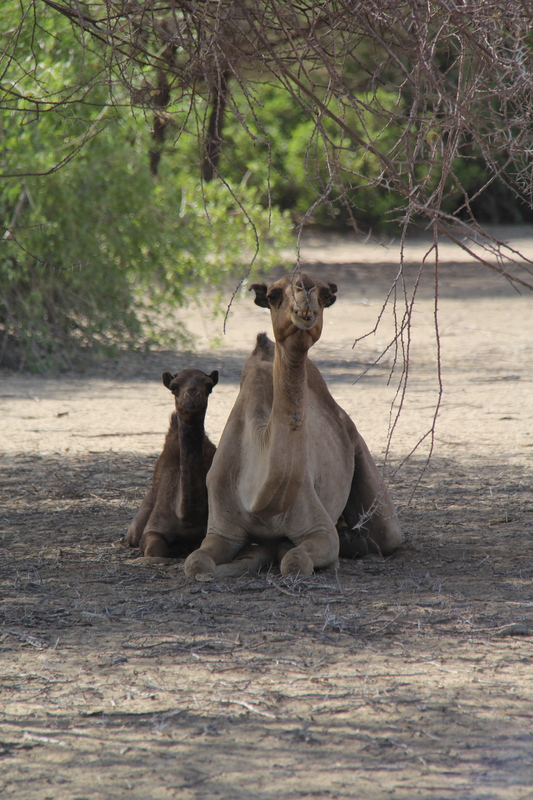 This is what working in the Turkana Basin is all about. Who were these people and what was their environment like? We wouldn’t have time to answer all of the questions, but we could get started. We had at least two places to dig now. Unfortunately, we discovered the skull fragment on a Saturday. This meant we had an entourage of curious children watching our enthusiastic gestures around the skull fragment. Ideally you leave it where you found it until you have the full context of the discovery documented down to the millimeter. But we had to pack things out, just to be safe. Ingrid and Natalie examine the fragment of human skull they found sitting on a small nose of sediment. 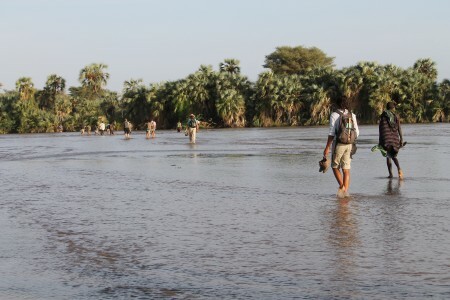 The opportunity for this kind of discovery is why we’re in the Turkana Basin. 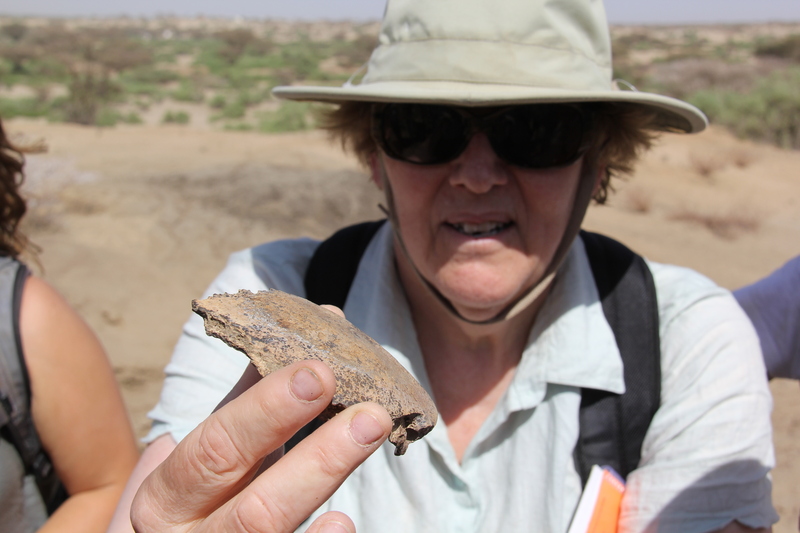 Dr. Alison Brooks examines a fragment of human skull from a large individual. How long was this buried in the ground before we found it? Maybe our excavation of the area would offer us some clues. When there’s no class in session, watching a bunch of people in funny hats rooting around in the dirt can be a pretty entertaining way to spend the morning. 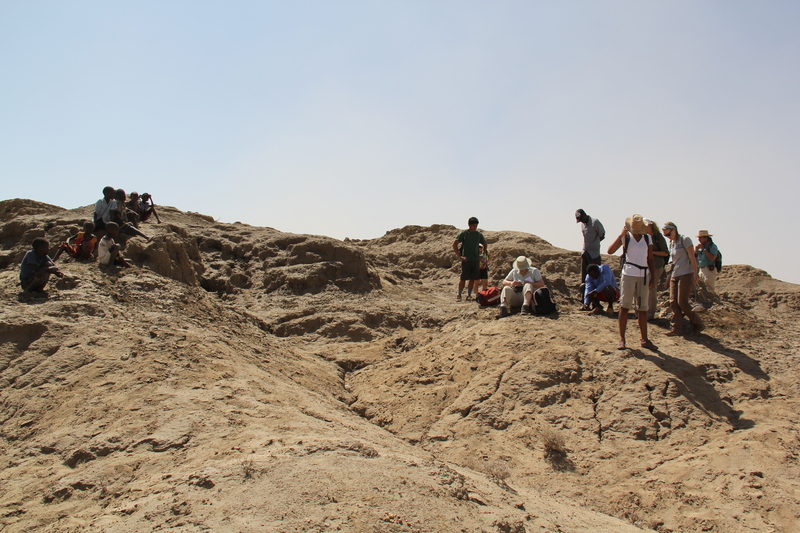 The students on the left watch the archaeologists on the right explore our skull fragment site (Left to right: Rob, Leanna, Dr. Brooks, Francis, Francis, Ana, Ingrid, Natalie, and Tim). But, this turned out to be ideal as Dr. Richard Leakey and Dr. Meave Leakey were both in camp at the time. They examined our skull fragments and shared their insights into the possible age of the people we were working with. 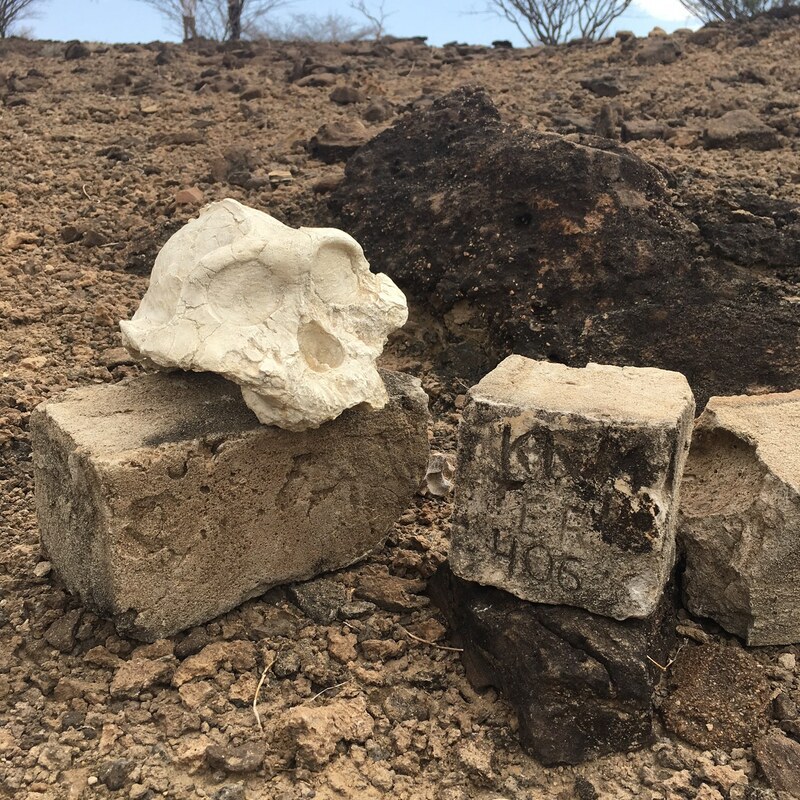 Nothing like forty years of experience in the Turkana Basin to highlight the important features in a fossil discovery.The bones weren’t looking particularly modern. The Leakeys agreed: we really had a cool site on our hands. 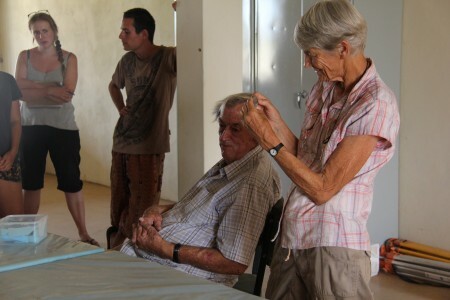 Dr. Richard Leakey and Dr. Meave Leakey examine a fragment of human skull discovered at Kangatotha. Suffice it to say, this was an expert opinion. 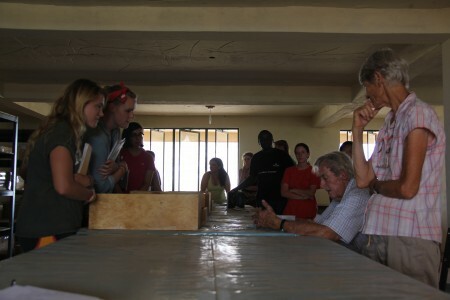 Dr. Meave Leakey and Dr. Richard Leakey discussed the morphology each had observed and the features that seemed to be most notable. 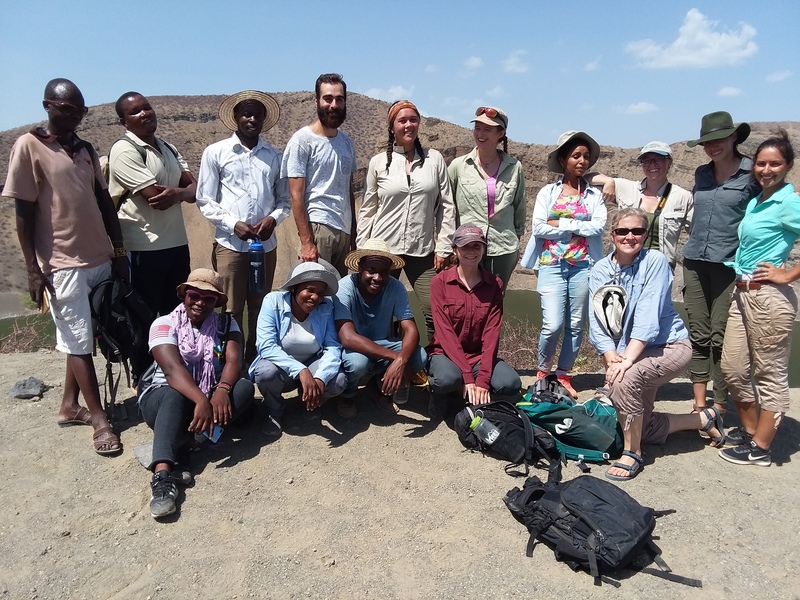 The field school students were treated to a brief insight into the factors experienced paleoanthropologists consider when they are handed a new specimen to diagnose. The next step was to crawl the two sites where human remains had been recovered. Flags were placed by each fragment of bone and each stone flake. 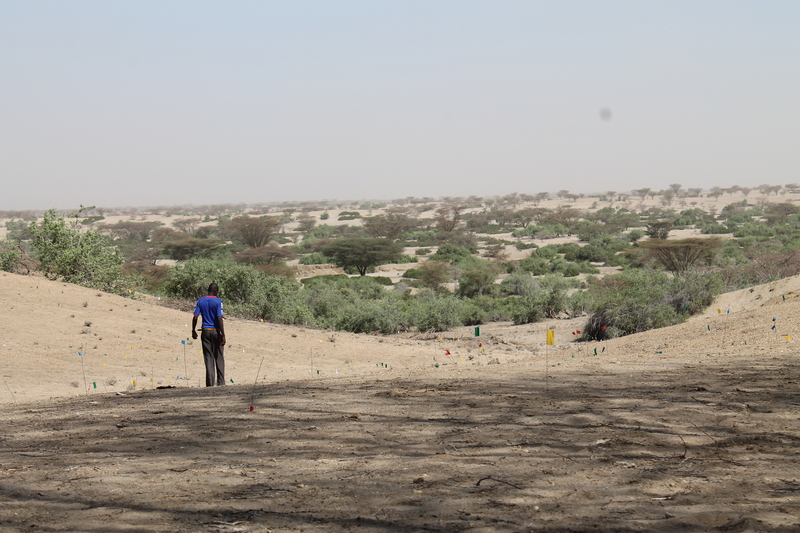 By tracking the distribution of flags, we hoped to discover the layer of loosely consolidated sand and silt that was yielding the artifacts. 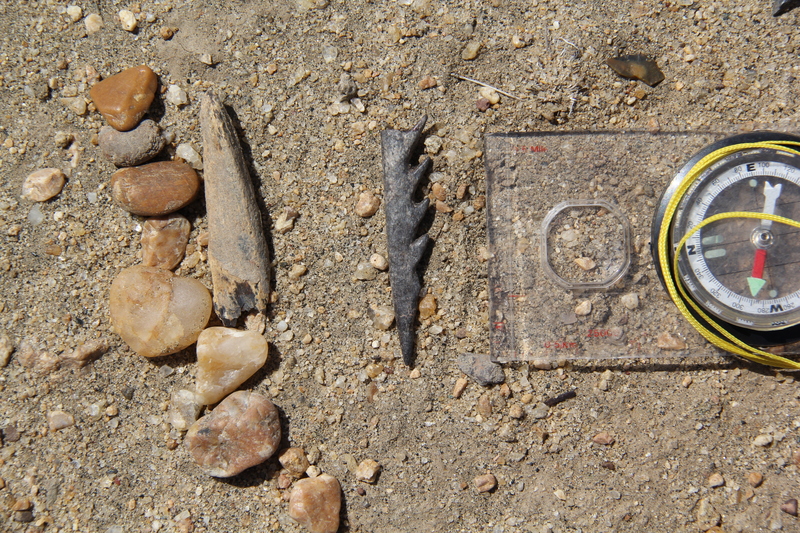 We quickly ran out of survey flags, a tangible indicator that the site was overflowing with interesting material. Survey flags pepper the slope below one of the skull fragments, illustrating the sediment horizons that are most likely to be producing the copious material we found eroded on the surface of Kangatotha. Francis is checking out the most interesting material that's weathered into the gully. One of the problems of archaeology is it is inherently destructive. Once an artifact is collected or the earth shoveled away, everything can’t be put back in its place for other researchers to examine the context of each discovery. 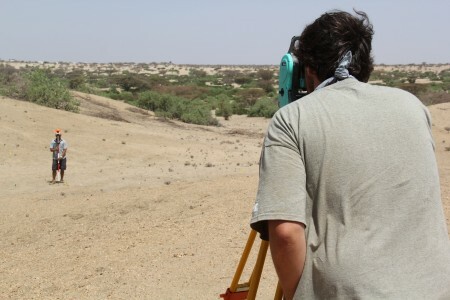 But artifacts can’t be studied without destroying a little context, so modern excavations create a digital reconstruction of the excavation using a piece of surveying equipment called a “total station.” The students learned how to lay a digital grid over our site and precisely record the position of every artifact recovered on the surface with laser-guided precision. The whole excavation can now be viewed with special 3D mapping software. John and Rob begin the exacting process of recording the position of each artifact discovered on the surface before we can begin excavating the site. 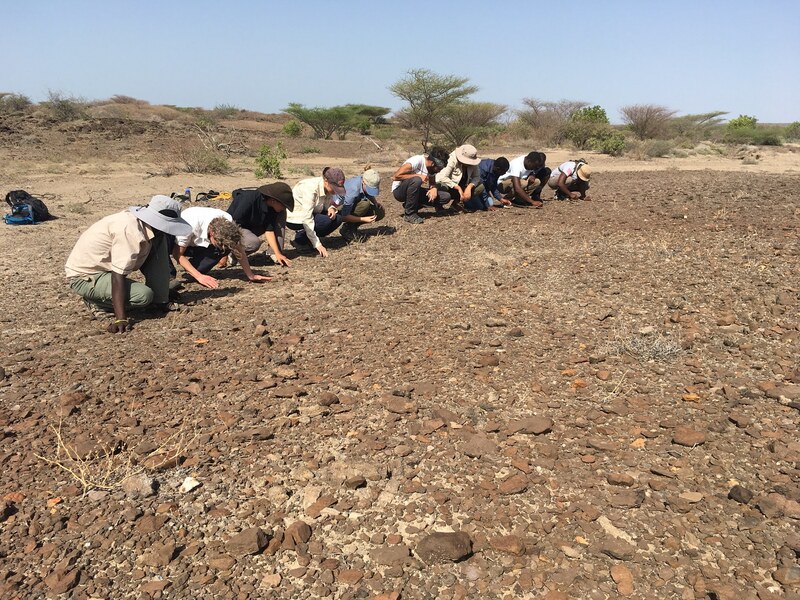 John takes aim at a basalt flake found downslope from the human remains that have transformed Kangatotha from a run-of-the-mill place to teach students how to use a trowel to a genuinely interesting site that will lead to real insights into the ancient people who lived in the Turkana Basin. 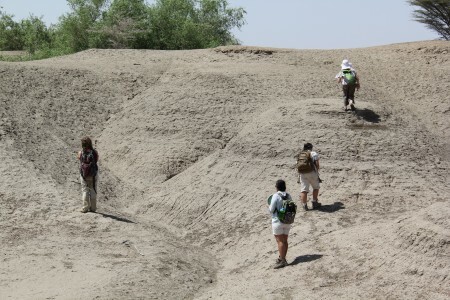 Once the surface was crawled for material – and more human remains were found – and all of the material was digitally recorded, we could place our excavation squares on the slope to collect even more information on the sedimentary history of Kangatotha and maybe find some ancient discarded material that would indicate how old our site was.